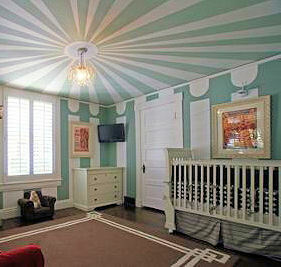 A circus nursery theme for a baby boy or girl brings your very own, personalized three-ring circus into your baby's room. We have some easy DIY circus theme decorating projects with painting techniques and crafts for you as well as lots of ideas for decorating the space in bright neutral colors, pink or blue, depending on whether the room is for a baby boy, baby girl or twins. You have a choice of circus nursery baby bedding for a contemporary style of circus decor with bold primary colors or a set better suited to a vintage circus theme in toile fabrics. A vintage circus nursery can be a beautiful foundation for antique circus posters, art and collectibles that may have been stored away in trunks for years. Go here to more circus baby bedding collections that can be picked up at bargain prices! Now is the time to put your collection on display because you are about to decorate a big top circus tent nursery beyond compare! Bring in the trained monkeys, the roaring lions and tigers, the trained seals and the ringmaster. Add a cool new Topsy Turvy Circus toile bedding set and let the show begin! This is just one of the great circus theme bedding sets that will kick your circus parade off in style! What a pretty light tan, chocolate brown and blue bedding set! Baby circus theme bedding sets come in great topsy turvy circus prints in baby boy colors and pretty pink Topsy Turvy toile for baby girls bedrooms. There are many darling circus print bedding fabrics and materials to work with in a circus theme, but the vintage toile prints are favorites of decorators everywhere. Here are some COOL and EXCITING CIRCUS THEME DECORATING ideas that will bring the circus to town right in your baby's nursery theme. You can easily make your own circus nursery decor as well as paint a crib in bright colors to reflect your theme and color scheme. There are several circus themed nursery bedding sets that you can use as a background or unique centerpiece for your Big Top circus nursery themed room. If you are torn between decorating with a classic toile or putting together a circus nursery theme bedroom, why not combine the two decorating styles for a completely unique and original look! Topsy Turvy Circus Toile print fabrics are used in several popular crib bedding sets. 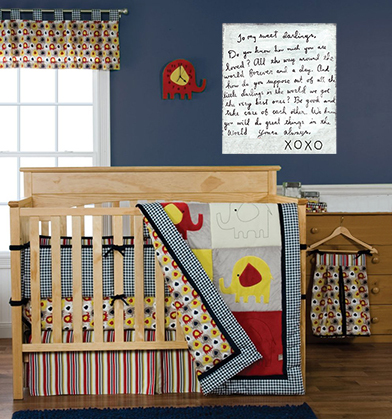 If circus toile does not fit into your nursery theme, there are other circus theme infant bedding in primary colors that will compete with the clown's big red nose for attention! If your preference is bright colors, decorate your circus nursery theme with combinations of white, yellow, blue, orange and red. Hang stuffed balloon shaped pillows in primary colors on the bedroom walls and hand paint the ribbons. Paint a funny, circus clown (or use clown decals if you can find them) to hold the ribbons to the balloons for a custom, affordable circus theme wall decoration! 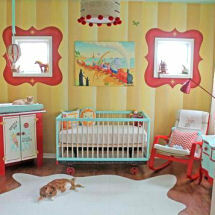 Hang a circus wallpaper mural or paint a circus mural on the nursery walls. 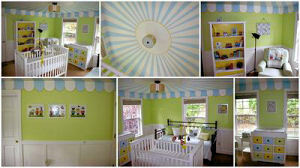 Your baby boy or baby girl will love growing up around the circus entertainers painted on the walls in the nursery. Arrange vintage circus posters and art work on the walls. Pick up old black and white or sepia toned Barnum pictures taken in the big top tent many years ago. Mix and match photos of the famous Ringling Brothers and Barnum and Bailey's performers on the high wire, the animal trainer or a circus clown performing his juggling act for your baby. Find a music box that plays an old time calliope tunes or any circus music that brings back childhood memories of the parade marching from the train to their tent across town. If you don't want to paint your wall decorations, consider stenciling something appropriate that will fit with your idesa of a circus nursery theme. Pick out some pictures to copy in a child's circus theme coloring book pages or activity book. Stencil the Ringling Brothers or the Barnum and Bailey Circus train travelling around the room with the lions and tigers in the cages. Think about how the animal cracker boxes looked when we were kids. You can use some wild animal stickers to make sure that each of the stenciled boxcars have a circus animal inside the cages. Customize your nursery furniture with painted balloons, clowns, or circus animals. Paint large, festive polka dots or stripes on the crib and dresser. Paint the rails of baby's crib in alternating colors seen elsewhere in the nursery theme. Paint the baby dresser in one color with brightly colored pulls and a nursery rocker in a shade on the opposite side of the color wheel. Buy a plain white ceiling fan and paint the blades with the same paint you used on your baby's nursery walls. Arrange a display of Jumbo or Dumbos elephant collectibles in a group on floating wall shelves. Shop the flea markets and antique malls for toys like a jack in the box with a monkey inside or make a plain stuffed monkey into an organ grinder's pet with a pill box hat and some small brass cymbals. If you have an old carousel horse with history in another room, bring it in and give it a new life in your baby girl's nursery! Get a brightly colored kid's circus area rug with zoo animals around the edges. If you need a round rug, a large circus ball shape would work just fine. Don't leave before you check out our gallery of pictures that is filled with beautifully decorated rooms designed by real moms just like us! Please visit Unique Baby Gear Ideas again soon to see the latest in circus nursery decor and crib sets.